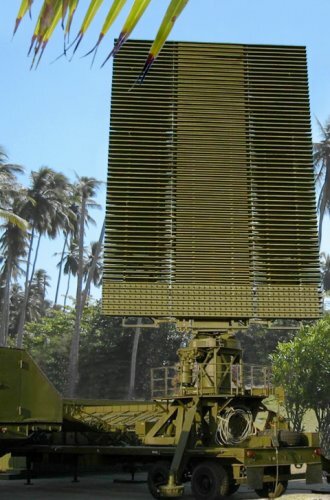 The multimode 3D-radar “Protivnik-GE” (russian designator: 59N6-E cyrillic: 59H6-E) designed to provide long-range accurate aircraft position data (range, bearing and height) for air defence, tactical control and navigational assistance for both close air support and counter air operations. This radar has been developed by Nizhny Novgorod Science Research Institute Of Radio Engineering (NNIIRT) in Russia. The whole system is mounted on two semi-trailers and has got an operating range of about 600 km. The radar has a high degree of measurement process automatization and a high resolution under intensive countermeasures. There are air route data processing, secondary air traffic control radar and suitable interface to any automatic control systems. Automatic diagnostics, monitoring and fault finding system are the features of this radar. The automatic mode of operation is also possible. Air search coverage of the radar extends to 200 km in height, i.e. this radar can discover satellites into the near orbit. All necessary information is read out in digital shape from a tricolour plan position high-aspect ratio display. Radar maping is possible. The phased-array antenna forms 20 Pencil-beams covering an elevation of total 45 degrees. The radar uses pulse compression to increase range accuracy and resolution and give a effective protection against noise jamming. The radar uses an adaptive beam scheduling processing by 10 redundant receiverchannels The application of standardised sub-assemblies provide an easy maintenance with help of a stock of spare parts. “Protivnik-GE” is in production since 1990. It raise the effectiveness of the air defense network of the air force and the air raid defences of the army.